"Should anything go wrong with the GPS-satellites, we would be catapulted back in time: not to the eighteenth century, but to antiquity." Satellite navigation is becoming ever more important. In just ten years, navigation devices guided by GPS have become an indispensable instrument in automobiles, and now the technology is conquering the mobile telephone. Satellites are also replacing radar technology for the navigation of ships, trains, planes, spaceships, submarines, tanks and (the reason why the system was originally designed) bombs. No matter how vital satellite navigation seems to be these days, the thirty American controlled GPS-satellites satellites were only launched into space from 1989 to 1994. Russia also has its own navigation system (that became redundant) and China has put forward developmental schemes for their now relatively limited Beidou system. For some years now, Europe has been trying to scrape together enough money for the building of its own system, Galileo. Until the year 2000, the GPS-signal was deliberately downgraded to an accuracy of 100 metres by the American defence. Since then, the commercial system is accurate to a distance of 10 to 30 metres (horizontal) and 20 to 60 metres (vertical). The US military forces now boast an accuracy range of less than 3 metres, which in combination with other techniques can be augmented to less than 1 centimetre. The GPS-system instantaneously informs users of their three-dimensional position on earth: in terms of degree of longitude (the position relative to the prime meridian in Greenwich), degree of latitude (the position relative to the equator) and altitude (the position relative to sea-level). To put it bluntly: today, even an idiot can determine his or her position on earth by pressing a button. Some centuries ago, it was possible to achieve a determination of your position on Earth which was almost as accurate as with GPS – but only with time, craftsmanship and significantly more complexity. Humans did not wait for the GPS to explore the globe. Naval voyages have been undertaken several thousands of years before the start of our era. On land, mankind started roaming even earlier. On terra firma, navigation is relatively simple. A landscape may have many possible orientation points, like mountain ranges or rivers, which can be remembered. On the ocean (or in deserts) those points of reference are much less apparent. The first seafarers stayed close to the coast and rowed or sailed from island to island. Gradually, they learnt how to make use of clues in meteorological data, such as clouds, currents, wind and waves. Long before the more well know European navigators, Polynesians had crossed thousands of kilometres of ocean in that way. That knowledge was completed with primitive navigation techniques based on the movements of the sun and other stars. In time, more navigation information was passed on to new generations, first orally and later cartographically. "Some centuries ago, it was possible to achieve a determination of your position on Earth which was almost as accurate as with GPS – but only with time, craftsmanship and significantly more complexity." Celestial navigation is mentioned in the works of Homer and Herodotus, in the Bible and the Norse sagas. This long standing history makes it one of the most successful technologies that humans have ever created. Celestial navigation was perfected with the start of the European voyages of discovery, and it continued to be the foundation of all navigation at sea and in the air until the mid twentieth century. To a lesser extent, it was also used at land. Only after World War II it was superseded by radio and later radar navigation. Radio navigation systems were shut down at the end of the 20th century, radar navigation is currently being superseded by satellite navigation. To determine one’s position on earth, one has to be able to find out the degree of longitude (east-west) as well as the degree of latitude (north-south). The latitude (the distance to the equator or the poles) has been easy to determine since antiquity - by measuring the angle of the sun relative to the horizon. Other stars could also be used for this, such as the polar star in the northern hemisphere. Throughout history several instruments were developed for the ‘shooting’ of stars, tools that became increasingly accurate and practical: the astrolabium (since the 4th century), the quadrant (since the 13th century), cross-staff (17th century), the octant and the sextant (both in the 18th century). The sextant is accurate to a resolution of 100 to 200 metres, depending on the quality of the instrument and the experience of the user. This is as accurate as the commercial GPS network was in 2000. Sextants were also developed for use on land, under water (in submarines) and in the air (balloons and later on aeroplanes and even the first space flight). 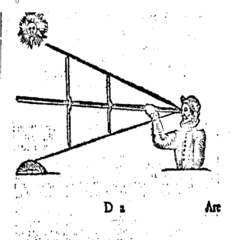 For use in the air (and on land) the sextant made use of an artificial horizon. Determining one’s degree of longitude (east or west) has always been a much harder task. To obtain this information, you have to know the time at the place where your voyage started. Today, this is achieved quite easily by adjusting your clock to the prime meridian (or another fixed position) and later comparing that time with the local time at sea. The sun circumnavigates the Earth in 24 hours (in reality it is the other way around, as mentioned earlier), which means that it moves 15 degrees per hour (360 divided by 24). If the time on the ship is 3 hours later than the time at Greenwich (or another chosen starting point), you find yourself 45 degrees west of your starting point. The problem was that accurate marine chronometers were only available from the second half of the 18th century – before that time it was impossible for sailors to know how long they had been at sea since their time of departure. Land clocks were terribly inaccurate on ships, because of the bobbing, humidity and climate variations. That’s why sailors made use of the concept “dead reckoning”. By means of a compass that provided information on direction (used by the western world from the 13th century) and a chip log that was used to calculate the speed of the boat, they deduced the possible course and the distance from their starting point – and were then able to calculate the duration of their time at sea. Computing the speed of the boat was done by throwing an object in the water at the bow of the ship, and then counting how long it took before that object (mostly a wooden beam on a rope) passed the rear end of the ship. Compass and ship log were also used to determine the degree of latitude when the starry sky was obscured by thick cloud cover – the greatest disadvantage of using celestial navigation. "The invention of the marine chronometer around 1760 was the missing link in the navigation system." Currents, wind and minor inaccuracies in measurements could lead to large deviations over long distances, which meant that lots of ships perished. Dead reckoning was helped a lot by an occasional point of reference, like an island, that could be used as a new starting point for the drawn course. An alternative for the determination of the degree of longitude was a calculation utilising moon tables, a method that was invented by astronomers before the arrival of the shipping chronometers. Those calculations, however, demanded several hours, which meant that the information was always outdated. The invention of the marine chronometer around 1760 was the missing link in the navigation system. It was now possible to accurately determine the degree of longitude and precise maps could be made which in turn provided navigational support in cloudy weather. In addition, a network of lighthouses, buoys and lightships was put in place, providing warnings of dangerous sandbanks or masses of rocks. The first lighthouses were built more than 2000 years ago, but thanks to the substitution of open fires with lamps at the end of the eighteenth century they became a lot more efficient and easier to operate. Ships also used gongs, bells and explosives to warn each other in a thick mist – mid nineteenth century these techniques were replaced by foghorns. At the end of the nineteenth century marine navigation had evolved, boasting a very reliable system that combined the knowledge of astronomers, mathematicians, cartographers and instrument builders. With the arrival of radio navigation and later on radar and satellite navigation, the whole system however, was quickly dismantled. Lighthouses and lightships were phased out, and now it seems only old and stubborn captains or puritans still use a sextant (which is, luckily, still being sold). Nevertheless, it is important that this prior knowledge is not being lost. GPS has made navigation more accurate, much faster and easily accessible. However, unlike celestial navigation, it is not a fool proof system as it is susceptible to destruction. Celestial navigation is not controlled by anyone, and it can not be destroyed by anyone. Radar technology (picture above) is more vulnerable than celestial navigation, but it is much more robust than GPS since it is a decentralized system. Progress has a price. Relying on one centrally controlled system for all navigation could be very dangerous. Should anything go wrong with the GPS-satellites, deliberately or by accident, all ships, planes, cars, submarines, backpackers and precision bombs would lose their way. In the field of navigation, we would be catapulted back in time: not to the eighteenth century, but to antiquity. Cargo ships, then and now : which one is the fastest?